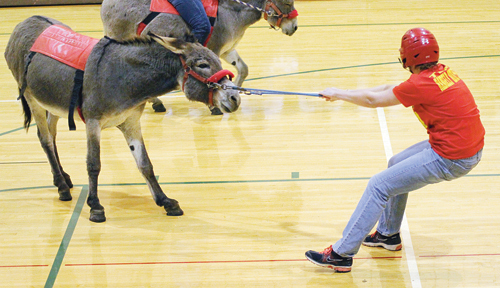 The Future Farmers of America chapter at Rangely Junior/Senior High School put on a donkey basketball game recently to raise funds for the chapter’s summer programs and travel expenses. The game, which was a sweeping success for those in attendance and the participants, was held at Parkview Elementary School. Four teams played in the event. RANGELY | The Rangely chapter of the Future Farmers of America will hold its inaugural Rangely FFA Auction/BBQ on Friday at the Rangely High School Lower Commons beginning at 7:30 p.m.
RANGELY — The Rangely FFA chapter has been keeping busy this year. In its second year as a chartered organization, the chapter’s officers have been planning and organizing.